Investment inflows in 1995 increased by 40 per cent, to an unprecedented $315 billion. Developed countries were the key force behind the record FDI flows, investing $270 billion (an increase of 42 per cent over 1994) and receiving $203 billion (53 per cent higher) (table 1). The spectacular growth of FDI among developed countries was accompanied by a hefty rise in flows into developing countries, which, at $100 billion, set another record in 1995; outward investment from developing countries also rose, reaching $47 billion. Investment flows to Central and Eastern Europe nearly doubled to $12 billion in 1995, after stagnating in 1994. Investment flows are concentrated in a few countries. The ten largest host countries received two thirds of total inflows in 1995 and the smallest 100 recipient countries received only 1 per cent. Investment going to the top 10 host countries is also more important for their economies than it is for the bottom 100: the share of FDI stock in GDP for the smallest 100 recipients is below that of the top 10 recipients. In the case of outflows, the largest five home countries (the United States, Germany, the United Kingdom, Japan and France) accounted for about two thirds of all outflows in 1995. Foreign direct investment is a major force shaping globalization. 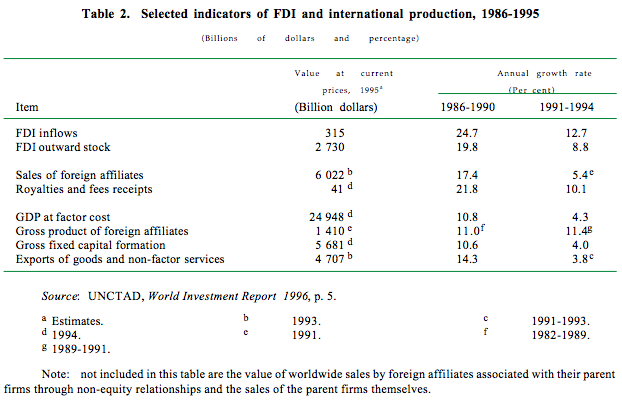 The outward FDI stock which the 39,000 or so parent firms invested in their approximately 270,000 foreign affiliates reached $2.7 trillion in 1995 (table 2). Moreover, FDI flows doubled between 1980 and 1994 relative to both global gross fixed capital formation and world GDP. And the value added of all foreign affiliates accounted for 6 per cent of world GDP in 1991, compared with 2 per cent in 1982. The latest surge in FDI flows reflects the fact that an increasing number of firms, including from developing countries, are becoming more active globally in response to competitive pressures, liberalization and the opening up of new areas for investment. These firms are once again using mergers and acquisitions (M&As) as a central corporate strategy for establishing production facilities abroad to protect, consolidate and advance their international competitiveness. The value of all cross-border M&A transactions (including those involving portfolio investments) doubled between 1988 and 1995, to $229 billion. The value of majority-held M&A transactions (excluding those involving portfolio investment and minority-held FDI) increased by 84 per cent in 1988-1995, to $135 billion. In Western Europe — the focus of M&A activity in 1995 — majority crossborder sales of firms were $50 billion and purchases were $66 billion. Much of that was due to intraEuropean Union deals. But the highest levels of M&A transactions in 1995 — $49 billion worth of sales and $38 billion worth of purchases — were registered by the United States. Industries with high cross-border M&A activity include energy distribution, telecommunications, pharmaceuticals and financial services. There was also a notable increase in participation of small and medium-sized and services-related enterprises. Overall, the M&A boom that began in the late 1980s, but was dampened by the FDI recession of the early 1990s, helped FDI flows to rise to record heights in 1995. …and is beginning to reflect the opening up of infrastructure to foreign participation. New investment opportunities in infrastructure, partly because of liberalization and deregulation and partly because governments turn more and more to foreign firms for capital and technology, have aided FDI to reach record levels. Infrastructure, especially communications, attracted FDI flows of around $7 billion annually in the early 1990s. This is but a fraction of the total investment requirements in infrastructure, much of which remains unmet. Investment outflows to infrastructure from the major home countries made up 3-5 per cent of their total outflows in 1995. In many countries, FDI flows account for less than 1 per cent of the gross fixed capital formation in infrastructure. For the United States, the largest outward investor, the shareof infrastructure industries in its outward FDI flows between 1992 and 1994 averaged 4.9 per cent a year. United States TNCs have invested $14 billion in infrastructure as of 1994, 2.3 per cent of its total outward stock. This share is small when compared with the share of FDI in infrastructure in 1940; then, more than a third of the United States FDI stock in Latin America was in infrastructure. Subsequent waves of nationalizations and expropriations, however, led to dramatic declines, a trend that has only recently begun to reverse. The revitalized interest of TNCs in infrastructure has been sparked by several factors. Recognizing that shortfalls in infrastructure services can hamper economic development, more governments are willing to privatize and relinquish control of state monopolies to attract foreign investment and technology and to realize efficiency gains. Between 1988 and 1995, infrastructure privatizations mobilized private capital of nearly $40 billion, more than half of which was foreign direct and portfolio investment. Furthermore, technological developments, notably in telecommunications, have turned infrastructure industries previously dominated by natural monopolies into competitive industries with potentially profitable investment opportunities. Capital raised from public sources in many countries is no longer sufficient to meet the financing requirements of infrastructure development. Privately sourced capital, often mobilized by TNCs, has therefore stepped in to help meet those requirements, including through new techniques of financing projects such as build-operate-transfer, build-own-operate, and build-own-transfer schemes. Despite the still low levels of FDI flows in infrastructure, future prospects for increased TNC involvement are promising. Despite their high fixed costs, many infrastructure projects are attractive to foreign investors. Continuing FDI liberalization and infrastructure deregulation, coupled with the growth of investment guarantees, helps to lower the risks of nationalization. Potential for greater TNC involvement in infrastructure is especially conducive to attracting FDI, such as the establishment of science parks, export-processing zones and facilities for human resource development. The world’s largest 100 TNCs (excluding banking and financial institutions), ranked by foreign assets, are all based in developed countries. They have roughly $1.4 trillion worth of assets abroad and account for around a third of the global FDI stock. That share has remained stable in the past five years. Royal Dutch Shell (United Kingdom/Netherlands) has topped the list of the top 100 TNCs every year since 1990 (table 3). 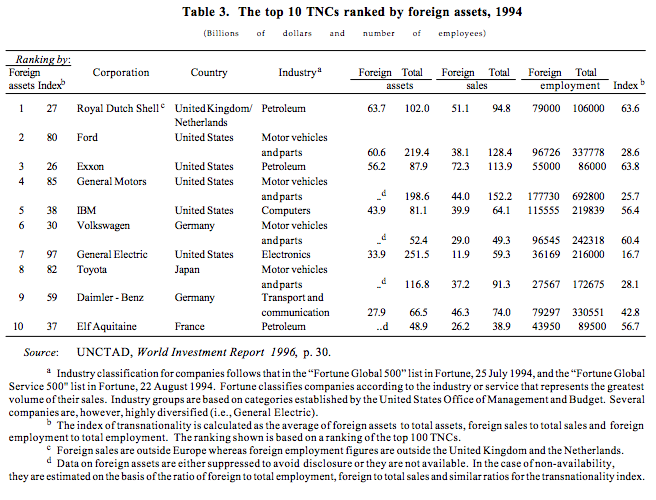 By country of origin, United States TNCs (with 32 in the top 100) are the largest group ranked by share of foreign assets in total assets in 1994. Japanese TNCs are the fastest growing group among the top 100, increasing in number from 11 in 1990 to 19 in 1994. Japanese TNCs in electronics were amongst the most important new entrants. European TNCs are prominent in capital- and research and development-intensive industries, such as chemicals and pharmaceuticals. By industry, TNCs in chemicals and pharmaceuticals score the highest rankings in transnationality index, followed by firms in food and electronics. Trading firms score lowest. The future investment plans of the top 100 TNCs suggest a strong upward trend in FDI (as well as total investment), fueled partly by economic growth in major destinations, among which the developing countries are becoming more prominent. But intra-developed-country FDI will continue to feature prominently in future investments of the top 100. Transnational corporations based in North America view Europe as the most important future investment location, especially in high-technology and consumer-goods industries. Likewise, European TNCs see the United States as the most important location. Japanese TNCs, however, view Asia as the most promising. Transnational corporations from North America and Europe also have a positive view of Asia; this region is therefore expected to capture the largest growth of planned capital investments by the world’s largest TNCs in the second half of the 1990s. … and the largest developing-country TNCs are moving in the same direction. The 50 largest TNCs based in developing countries, ranked by foreign assets, accounted for about 10 per cent of the combined outward FDI stock of firms in their countries of origin. These firms’ ratio of foreign to total sales is high (30 per cent), but their ratio of foreign to total assets (9 per cent) is low. Their overall index of transnationality (21 per cent) is low, compared with that of the world’s top 100 TNCs (42 per cent), reflecting their short history as important outward investors; but their plans for expansion suggest that they will become increasingly more transnational. 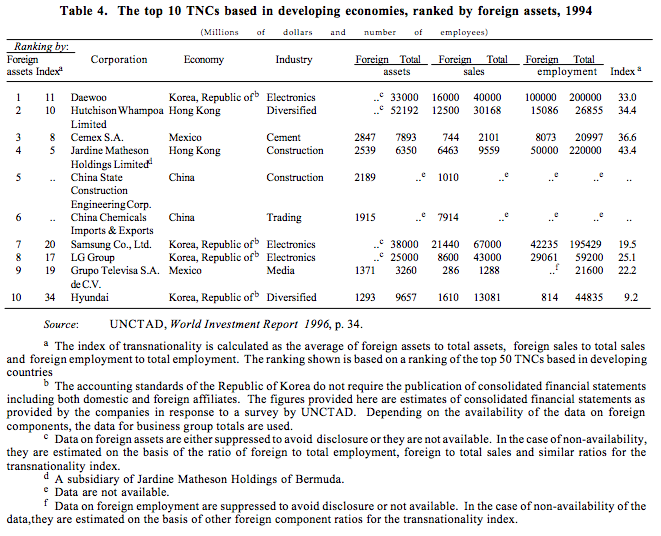 In 1994, Daewoo (Republic of Korea) ranked first among the 50 largest TNCs from developing countries on the basis of the ratio of foreign to total assets (table 4). Mexico’s Cemex, the top TNC among developing country firms in 1993, ranked third. On the basis of the transnationality index, Creative Technology (Singapore), a producer of standard personal computer sound systems that holds more than 60 per cent of the global market share, was in first place in 1994. By country of origin, TNCs from China and the Republic of Korea, with eight entries each, were the largest groups among the top 50 developing country TNCs ranked by foreign-to-total asset share. By industry, TNCs in construction and electronics had the highest rankings. Almost 90 per cent of the 1995 increases in FDI inflows (and outflows) were registered by developed countries. Because of this, the share of developed countries in world inflows increased from 59 per cent in 1994 to 65 per cent in 1995, while outflows rose from 83 to 85 per cent. The growth of developed country FDI was led by a few countries — the United States, United Kingdom, France and Australia, in that order, in the case of inflows, and the United States, United Kingdom and Germany, in that order, in the case of outflows. With large increases in inflows and outflows in 1995, the United States strengthened its position as the largest host and home country. With $60 billion, United States inflows were twice that of the United Kingdom, the second largest recipient among developed countries. Reflecting high levels of M&A-related investment by Western European TNCs, led by the United Kingdom and Germany, equity flows into the United States rose by 50 per cent. Reinvested earnings and intra-company loans (the other components of FDI) increased by 78 per cent and 36 per cent, respectively. Likewise, the $95 billion worth of United States outflows in 1995 reflected both record equity capital flows ($42 billion) and record reinvested earnings ($42 billion); 54 per cent of these outflows went to Western Europe. The United Kingdom and Germany also registered record outflows in 1995, $38 billion and $36 billion, respectively. Large-scale investments in the markets for its main exports (the European Union and the United States) characterized FDI from the United Kingdom. German TNCs directed their attention to investment opportunities abroad, partly to escape cost increases and currency appreciations at home and partly because investments in the eastern part of the country have abated with the completion of the privatization programme. Increases of 20 per cent in 1994 and 15 per cent in 1995 are strong signs that Japanese FDI outflows are recovering. Japanese TNCs are investing abroad faster than at home. 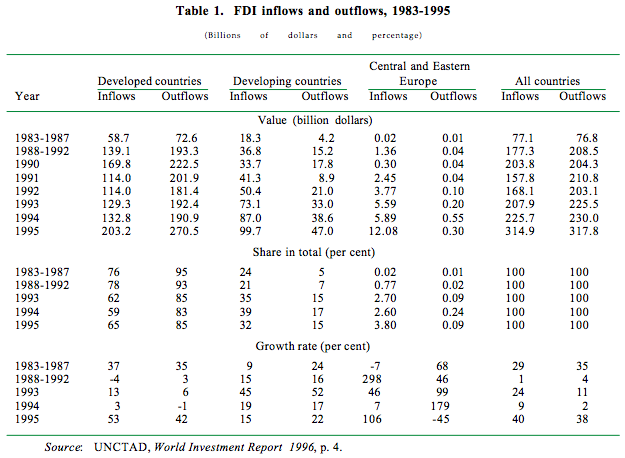 However, 1995 FDI outflows were still less than half of the annual average in 1989-1991. Most Japanese FDI goes to East and South-East Asia and developed countries, and is aimed at establishing regional or global networks (efficiency-seeking FDI) or supplying local markets. Investment flows to Africa and Central and Eastern Europe have been small, accounting for only 0.1 per cent and 0.3 per cent of Japan’s total outflows, respectively, in 1990-1994. To recover and increase their international competitiveness, Japanese affiliates are establishing “second generation” affiliates abroad. For example, 47 per cent of Japanese affiliates in Hong Kong, and 43 per cent of Japanese affiliates in Singapore, have already established their own foreign affiliates. …while flows to developing countries advanced, and those to developing Asia boomed. The current boom in FDI flows to developing countries, with inflows reaching $100 billion in 1995, is a reflection of sustained economic growth and continuing liberalization and privatization in these countries, as well as their increasing integration into the investment plans of TNCs. The share of developing countries in the combined outflows of the largest five developed-country outward investors rose from 18 per cent in 1990-1992 to 28 per cent in 1993-1994. Investment from developing countries to other developing countries is also increasing: in 1994, for example, more than half of the FDI flows from Asian developing countries were invested in the same region. South, East and South-East Asia continued to be the largest host developing region, with an estimated $65 billion of inflows in 1995, accounting for two thirds of all developing-country FDI inflows. The size and dynamism of developing Asia have made it increasingly important for TNCs from all countries to service rapidly expanding markets, or to tap the tangible and intangible resources of that region for global production networks. European Union TNCs, in particular, after neglecting Asia in the past, are now changing course and investing more. China has been the largest developing-country recipient since 1992. Although inflows are soaring in other countries as well, with 58 per cent of inflows to South, East and South-East Asia in 1995, China has been the principal drive behind Asia’s current investment boom. Recent FDI policy changes in China may dampen these flows temporarily, however. China is moving towards national treatment, eliminating gradually some preferences for foreign investors, such as exemptions from import duties, that have distorted markets, encouraged “round-tripping”, speculative investments and “phantom” foreign ventures. However, given China’s outstanding growth performance and the continued opening of new areas to FDI, such as infrastructure, its attractiveness to foreign investors is unlikely to be affected seriously. Hence, Asia’s investment boom will probably be sustained in the coming years. Latin America and the Caribbean saw a 5 per cent increase of FDI inflows to $27 billion in 1995. Most, however, was concentrated in individual industries (automobiles in Mexico and Brazil, natural resources in Chile) or privatization-induced (in Argentina and Peru). Investment flows in Latin American countries are therefore susceptible to special circumstances in those industries or to privatization policies. Especially at the country level, investment flows are prone to wide year-toyear fluctuations which makes them “lumpy”. Argentina, Peru and Venezuela provide illustrations of lumpiness in FDI: when some large companies were privatized in the early 1990s, investment inflows soared. In the following years, however, they fell considerably, which was only partially offset by post-privatization investments. Investments in large mining projects or in industries such as automobile manufacturing may also cause “spikes” in FDI flows and lead to lumpiness. Lumpy FDI flows can not only change drastically the ranking of FDI recipients from one year to the next, but also the industrial composition of investment flows for a given country. For example, in Peru, communication and transport accounted for 42 per cent of its 1995 inward FDI stock, compared with 0.4 per cent in 1990; the “spike” in 1995 was the result of a large telecommunications privatization. With large-scale privatizations beginning to be implemented in Brazil and with the launching of large investment projects in automobiles, lumpy FDI will continue to shape the level and composition of flows to Latin American countries for some years. The FDI stock in Africa doubled between 1985 and 1995. Inflows to Africa, however, have not been rising as rapidly as inflows to other regions. In 1995, they were almost the same as in 1994 — $5 billion. The share of Africa in developing-country inflows therefore fell to 4.7 per cent in 1995 (from 5.8 per cent in 1994). But within Africa, there have been significant changes in the geographic pattern of FDI. In the 1980s, southern Africa accounted for more than 40 per cent of Africa’s FDI stock, but its importance has diminished substantially since, and by 1993 it accounted for about a quarter of Africa’s stock. In contrast, North African countries, which in 1980 accounted for a mere 12 per cent of total stock in Africa, have substantially improved their position, accounting for more than 30 per cent by 1993, due mainly to the rising levels of European investments. Investors from the developed countries have displayed uneven interest in Africa. Due to geographical proximity and post-colonial ties, Western European investors have always been more active compared with both United States and Japanese investors. Within Western Europe, France, Germany, Italy and the United Kingdom are the main investors in Africa. Significant variations exist in the importance of FDI for African’s recipient countries. For countries with large inflows, such as Nigeria, FDI is not as significant relative to the size of the domestic economy as it is for countries with small flows, such as Equatorial Guinea. …and Central and Eastern Europe sees a surge in response to economic recovery. Driven not only by waves of privatizations, but by economic recovery in some countries (Poland and the Czech Republic), FDI inflows to Central and Eastern Europe have soared to record levels. Having remained stagnant in 1994, inflows almost doubled in 1995, to reach an estimated $12 billion. The region accounted for 5 per cent of world inflows in 1995, compared with only 1 per cent in 1991. Hungary and the Czech Republic accounted for about two thirds of the increase in 1995, with inflows tripling to $3.5 billion and $2.5 billion, respectively. The 1995 FDI flows into the Russian Federation at an estimated $2 billion were double the 1994 level. A significant share of the FDI received by Central and Eastern European economies — 18 per cent in 1994 — is from privatization of state enterprises. However, this share has declined considerably compared with 1989-1993 when, for the main recipient countries (excluding the Russian Federation), privatization-related inflows accounted for most FDI. The trend in FDI inflows and, in particular, non-privatization related FDI inflows, is correlated with the growth of domestic output: in most countries, FDI inflows picked up when GDP growth became positive. Thus, while many foreign investors rushed to establish a nominal presence in Central and Eastern Europe as countries began to liberalize their investment frameworks in the late 1980s and early 1990s, it was only when transition was well under way and negative growth rates of GDP began to reverse that TNCs began to invest significantly. The doubling of FDI into the region in 1995 reflects the recognition by TNCs that Central and Eastern European countries, particularly those in Central Europe, are well on the way to becoming market economies. Part 1 - Global and regional trends Part 2 - Foreign direct investment and trade: interlinkages and policy implications Part 3 - Towards a multilateral framework for foreign direct investment? World FDI flows reached a record high in 1995, ... ...aided by a boom in mergers and acquisitions, increasingly used as a corporate strategy... ...and is beginning to reflect the opening up of infrastructure to foreign participation. The world’s largest TNCs are becoming more transnational... ... and the largest developing-country TNCs are moving in the same direction. Led by the United States, developed countries experienced rapid growth of FDI flows in 1995,... ...while flows to developing countries advanced, and those to developing Asia boomed. Investment flows to Latin America and the Caribbean have risen, but continue to be “lumpy”,... ...while Africa remains marginalized ... ...and Central and Eastern Europe sees a surge in response to economic recovery.